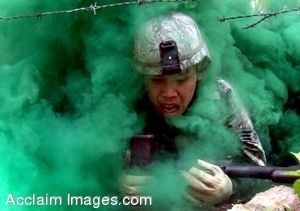 Description: Clip art photograph of a student in the Air Force Phoenix Warrior Training Course participates in a combat first aid class on a Fort Dix, N.J. The course is taught by the U.S. Air Force Expeditionary Center's Expeditionary Operations School and 421st Combat Training Squadron and prepares security forces Airmen for upcoming deployments. (U.S. Air Force Photo/Tech. Sgt. Scott T. Sturkol). Clipart photograph by Department of Defense Public Domain.